Are you looking for ideas on how to remove wood stain from wood? Learn some effective techniques to remove a wood stain product from wood without hurting woodwork. Sometimes it is necessary to remove a wood stain or finish from woodwork or furniture. It may be because you want to try to uncover the original wood or perhaps replace it with a new type of stain. This can sometimes be difficult to do without ruining the wood, but there are gentle methods that can keep wood in good condition. Prepare the woodwork for stripping. If dealing with furniture, remove attachments such as knobs, handles or other decorations. Cover the working area with a sheet or tarp to prevent surrounding areas from getting dirty. Apply the wood stain remover product, following the manufacturer's instructions. Many can be applied with a paint brush, others can be sprayed on. It is important to follow all of the manufacturer's directions to prevent wood damage. Many stain and paint remover products sit on wood for up to 40 minutes but time varies, depending on the product. Test part of the surface by dabbing a small section with a rag to see if stain is lifted. When the stain remover is ready, it is time to remove it with one of two methods - water rinse or scraping away. A water-based formulation can be removed by rinsing with water and using steel wool followed by drying the woodwork thoroughly with a towel. Use steel wool and a scraper to clean off nonrinsable stain removers. A light sandpaper can also be used. Discard scrapings in the garbage. Apply mineral spirits to a paraffin or wax-based stain remover prior to scrubbing the surface with rags unless the manufacturer instructions say otherwise. Treat wood with denatured alcohol to make sure that the remover is completely gone. Dry with a towel. Then apply mineral spirits to the woodwork. Dry completely with a towel. 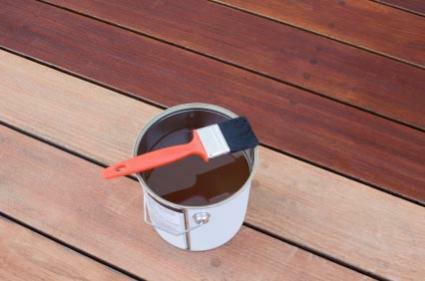 It's important to choose a wood stain remover or wood stripper product that is compatible with your woodwork. Wood stain remover come in the liquid or semi-paste forms. Liquids are fine for flat surfaces, but semi-pastes work better for curved areas. Wood stain remover formulas are either nonrinsable or rinsable. The nonrinsable formulas usually contain paraffin, wax or methylene chloride and are removed with scraping methods. The rinsable formulas do not require heavy scraping to remove stain. Always test the stain remover product on a small area of the woodwork to make sure that it isn't too harsh. Learning as much as possible about how to remove wood stain from wood can help you pick the best technique for your project. Work in a well ventilated area because many wood stain removers contain strong chemicals that can cause respiratory problems with overexposure. Open a window, if necessary, when working with wood stain removers. Some basic wood stain and paint removers work better when covered with aluminum foil after application. The aluminum foil helps the stain remover penetrate the stain finish. Avoid using power sanders, ammonia, heat or lye to remove wood stain unless you are experienced with removing wood finishes with these methods. These short cut methods for removing stains can easily irreversibly damage wood surfaces. Power sanders are commonly used for wood floors and decks. If you truly prefer using a sander for removing stain, get an expert to do it to prevent damaging the wood. Do your research and make sure the wood stain removal technique is safe for your woodwork. There are safe ways to remove wood stain and keep your woodwork beautiful.